Who’s in the Room? 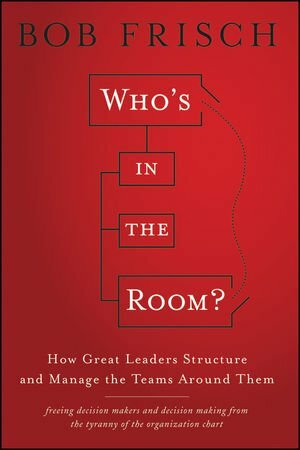 : How Great Leaders Structure and Manage the Teams Around Them reminds me of the classic political science booklet by Lloyd S Etheredge, The Case of the Unreturned Cafeteria Trays: an Investigation Based on Theories of Motivation and Human Behavior (pdf). Both take a simple problem and explore various alternatives to how it can be approached. “Trays” is more systematic and has been widely used since 1976 to teach undergraduates how to approach problems scientifically from various perspectives or theories. Bob Frisch also draws generously from science, primarily organizational psychology, but the book is aimed at executive management. Its strength lies not so much in creating a typology of theory but in the practical wisdom Frisch has gained by working as a consultant and facilitator with a wide variety of companies. The simple problem addressed by Who’s in the Room? involves the dynamic tension between informal “kitchen cabinets” used by CEOs and formal senior management teams (SMTs). Of course companies need both and Frisch not only does an excellent job of telling the reader why but explains how to increase understanding through explicit exercises and directions, freeing both to do what they do best. Frisch uses simple metaphors, like “testing walls and fences,” to help readers explore the boundaries of a company’s business model. He helps you test your assumptions so that you don’t waste time assessing opportunities that won’t fit but also don’t unreasonably constrain creative ideas. The difficulty of prioritizing initiatives is explored and Frisch guides his readers with ideas on how to change the conversation by clustering ideas, rather than rank ordering; using fuzzy logic, rather than false precision; making initiatives work together. I don’t know if Who’s in the Room? will become a classic like The Case of the Unreturned Cafeteria Trays but I do know it is a super quick read from an author who has probably given more thought to structuring and deploying management teams than 95% of his readers. The price of admission is minimal for the knowledge you are likely to gain.